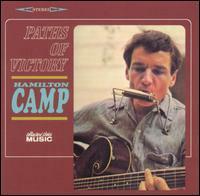 Paths Of Victory, Camp's debut solo album, boasts no fewer than seven Dylan covers including the title song Paths of Victory, Camp's classic recording of Get Together, and his own folk classic Pride Of Man which was also recorded by Gordon Lightfoot and Quicksilver Messenger Service. The song's lyrics took on a new meaning after 9/11. Girl from the North Country also appeared on Elektra EKL 9001 [Mono], The Folk Box - Various Artists, a four record boxed set released in 1964, and Elektra S-78 [Stereo], Folksong '65 - Various Artists. Get Together appears on the Rhino Records 3 CD boxed set Washington Square Memoirs R74264 (2001). Pride Of Man appears on the 5 disc Elektra boxed set Forever Changing: The Golden Age Of Elektra Records 1963-1973 R74745, R74746 (2007/2006).